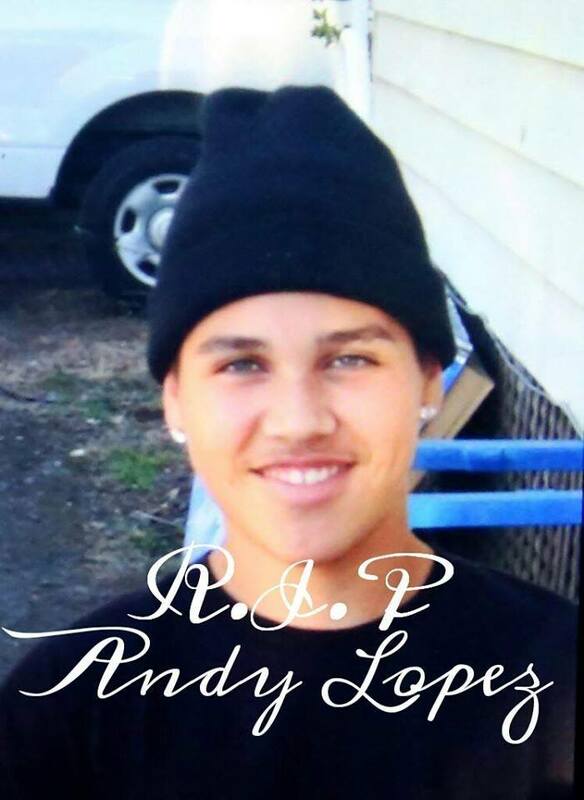 Sending love & comfort & solidarity to young Andy Lopez' spirit and his family & community. 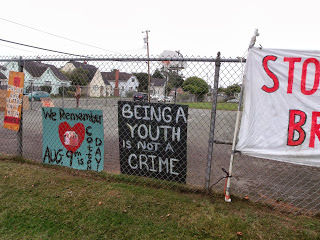 13 year old Andy was killed by Santa Rosa deputies on Oct 22.
from Verbena On the night of Oct 22, 2013, while some protestors slept at Cesar Chavez park, a couple of us went, from midnight to 3am, to the Humboldt County Jail for "Welcome Out"! 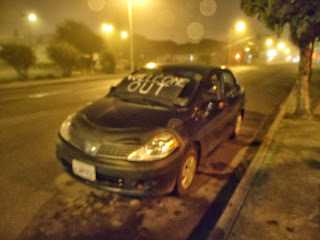 We sat in a car right near where people exit the jail, with a bin of warm socks and clothes, tobacco, and a sign on the windshield to welcome people out on the cold, blustery night. It is such a worthwhile and necessary activity; should be a regular thing. We encountered about 7 people who needed something warm, the use of a phone, maybe a cigarette, a friendly face and listening ears. The next morning, October 23rd, people gathered for breakfast at Clarke Plaza, open to everyone who was hungry or wanting coffee or tea. 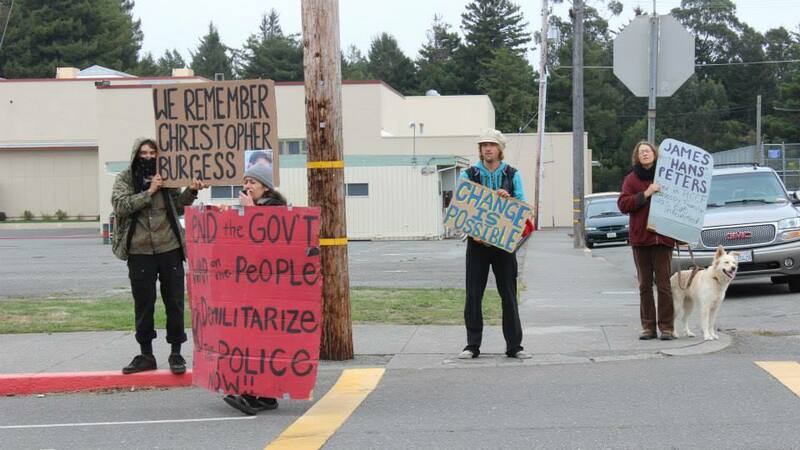 One of Chris Burgess' brother's came by; this being the 7th anniversary of his brother's death. Even those of us who never met Christopher during his short life, will always remember him. from Skye 10-25-13 For the past eighteen years, cities across the United States have rallied on October 22nd to show solidarity against police brutality. 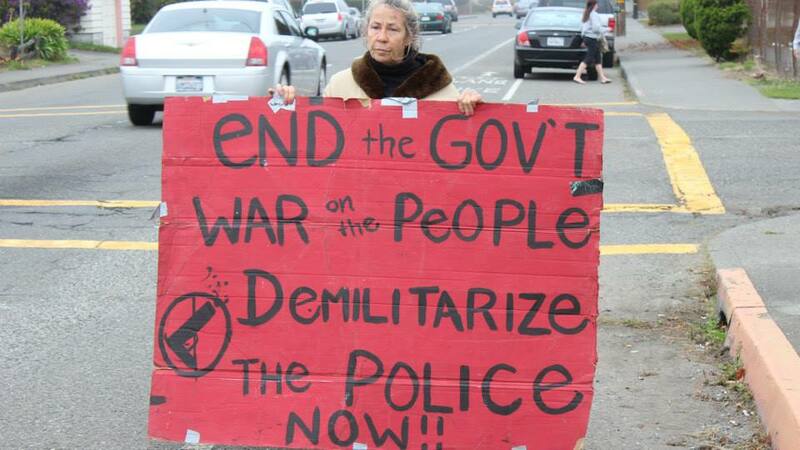 I am learning that occurrences of police brutality are much more numerous and severe in the United States than they are back home in Canada. A sad truth that is only deepened through the discovery that such violence often leads to death. This sharp reality felt all too often in the communities of the most northern part of California where police brutality ranges from daily intimidation to outright murder, tasering to decades of confined isolation. Marching along an unplanned route, the group walked past the high school as the students were being released for the day. Many showed their support to the idea of removing police from schools. An understandable reaction from students who are finding their schools resembling prisons more and more - security check points, undercover police, random locker searches, metal detectors. I hope we realize soon that treating people like criminals does not help in any way, especially when they are not. After a quick break the group continued to march through the city, waving signs, yelling chants, and throwing up peace signs to passing traffic. Much to the group's gratitude, the police encounters passed by without incident. Many people showed their support for our protest with honks from their vehicles as they drove by. The drivers who found themselves in a hurry were not too pleased with our presence on the street, even though we always left room for them to pass around. An understandable reaction to the injustice of having one's life run by a clock - we wished them free time in response to their show of frustration. As the time to march came to a close, we stopped at another park to set up for the evening's events. An abundant feast was gifted to the sore footed group to nourish their bodies and hearts after the day's walk. And while we ate, entertainment of the highest calibre was shared for our pure enjoyment. 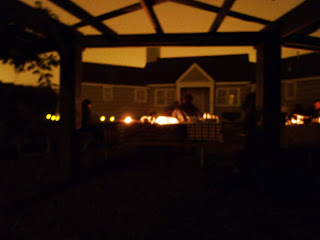 As night fell the community came a little closer together through the sharing of gifts and the exciting of our taste buds and ear drums. The live music provided reflection and introspection, as well as laughter and participation. Deeper connections were made as we were given space to share stories, jokes, and hugs. Through the coming together over a common surface problem, we are given practice to dive deeper into a shared community experience. After dark fell, a humid, foggy candlelight vigil took the remaining group back to the day's starting point for an overnight park camp out. This is where my path diverged - to return the next day in the late afternoon with one of my gifts - fresh cucumber mango guacamole and baked yam fries. Posted on a busy street corner with signs and free food for whomever was hungry, the group honored the fallen victims by sharing their stories with passerby's. Another year to gather and remember those whose lives continue to be afflicted by the brutality of violence from those we give our trust to be protectors. I am grateful for the opportunity to show support to a community bringing awareness to an important shadow of our culture - the disconnection that allows one person to take another's life and to perpetuate violence of the most disgraceful sort. The pervasive and obvious favoritism, elitism, and corruption infecting the enforcement agencies of this area have left me stunned and humbled. I honor and acknowledge the challenges faced by a population of people who are dealing with such a horrible treatment on a regular basis. No being deserves oppression at any level - be it physical, psychological, or spiritual. To commit such acts of violence require a disconnection from one's heart so vast that the whisper of consciousness seems to have disappeared entirely. Somewhere inside, buried deeper in some, the spark of light resides and awaits its chance to be heard and felt. This light exists in all of us. A hell inside creates the horrors of our lives. The love inside creates heaven on Earth. In this dawning age of truth, justice, and integrity we are each asked to step into our highest expression and to take responsibility for the actions we take and words we speak. Are you looking at a badge, uniform, or costume - or are you looking into someone's eyes and seeing them standing there - as scared as you are - as full of beautiful creative potential as you are? The resolution and healing processes being born through the new consciousness of humanity will seek not the false, demeaning, and inadequate deterrence and 'punishment' oriented solutions, but ones focusing on root causes, emotional healing, and collective community restoration. Sickness and health in a community is shared by all.